So I had me a facelift. It's all the rage currently. Satisfied by the result, not mightily but satisfied. 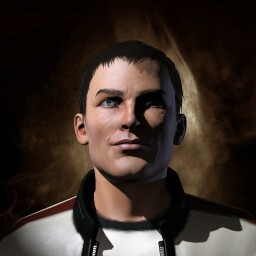 The power and magnificence of my station need to be properly displayed on my face for any potential crewman to behold. Nowadays, with all the competition in 0.0, plus one fine carrier to man, I need to pump up the propaganda to recruit enough. So my face is like a new flag. The Man. Sign here and here. Some of the juvenile enthusiasm is gone, though, and you can read it on my skin. The Tau Ceti Federation is no more, just a hollow shell against name-stealers, a reminder that all glorious things come to pass and I am no different. We just need to make the best out of the time left. You will read much more in the mirror the day you replace me, count on it.